Blue and white pottery, also known as “Delft Blue”, had been made in and around Delft, Holland, from the 16th century onwards. Delftware became popular and was widely exported in Europe. It even reached China and Japan. The most highly-regarded period of production was about 1640-1740. Besides plates and vases, Delft potters also made tiles in vast numbers. The brothers Johannes and Cornelis van den Abeele were ceramists, creating pottery in Delft, Holland. They were sons of Corstiaan Jansz van Abeelen and his wife Trijntje Pouwels. In 1692 they were living within the city of Delft in a street named “Achterom”. Johannes van den Abeele was baptized on February 3, 1664, in Delft. He had elder brothers Winant and Pouwels and an elder sister named Geertruijt. On September 6, 1692, Johannes was married to Anna Hendrix Dorrée. Anna was baptized on December 21, 1670, in Delft as daughter of Hendrick Stoffelsen Dorrée and Tryntien van de Winckel. In the period 1693-98 Anna gave birth to 4 daughters named Trintie, Geertruij, Jacoba and Elsie. Cornelis van den Abeele’s intention to marry was published on December 12,1693. His intended bride Maria Jans Vree, who was living just outside the city walls of Delft in an area named Vrijenban. She was a daughter of Jan Vree (†1680) and Lijsbeth Oosthoeck (†1726). In the period 1694-1716 Maria Jans Vree gave birth to 9 children named Korsteijaen, Jan, Wijnant, Paulus, Elijsabeth, Trintie, Marija, Adriaan and Lijsbet. Two of these children were buried near the New Church of Delft in July 1712 and November 1716. Maria Vree, wife of Cornelis van den Abeelen, living in the Gasthuijslaan, was buried on May 31, 1728, near the Old Church in Delft. At the time one child and a grandchild were still alive. Cornelis van den Abeelen was buried near the Old Chruch Delft on Feburary 5, 1731. 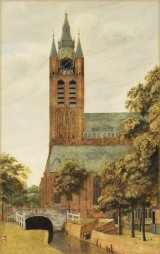 Sources: Collectie-Delft.nl, Histoire de la faïence de Delft.